Omega is a class act. Roman Reigns' return to WWE TV was unsurprisingly met with welcoming reactions. The wrestling fraternity is elated for the Big Dog as the past few days have seen many thoughtful tweets from well-known figures regarding the comeback. Despite being a competitor from a rival promotion, Kenny Omega took some time out to send out a very classy message to Reigns, on Twitter. Reigns returned to Raw this past week and revealed that his leukaemia was now in remission. He looked as good ever and said that he was ready to return to action. Later on in the night, Reigns along with Seth Rollins came out and saved Dean Ambrose from a nasty ambush from Drew McIntyre, Bobby Lashley, Baron Corbin, and Elias. The fans got a glimpse of the Big Dog in action as he cleared house and teased a potential Shield reunion. Omega organized a Twitch stream this week wherein he played Apex Legends with the fans while also sending out exclusive Razer merchandise. 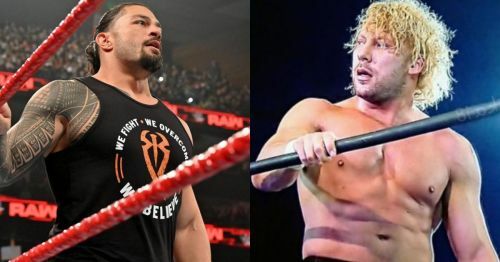 The stream took place during the episode of Raw that had Reigns' return and it was natural for the former NJPW Superstar to keep tabs on what was happening on WWE's red brand. They may be on either side of the warring promotions but Reigns' unfortunate predicament united the pro wrestling community in unprecedented fashion. It's a great gesture from Omega, who is scheduled to face Chris Jericho at All Elite Wrestling's debut show. AEW's Double or Nothing is set to take place on May 25th, 2019 at MGM Grand Arena in Las Vegas, Nevada. As for Reigns, the former Universal Champion is rumored to be involved in a handicap match at the upcoming WWE Fastlane 2019 PPV.